Join us for an evening of deep listening and meditation in the moss garden in response to the current exhibition Arrangement at Crate. A listening session and open jam for the plants. Journeying through the world of the secret life of plants, Katie will share a set of found sounds & texts designed for the plants as the active listener- to encourage optimum growth, health & happiness. Including sounds from the deep & pondlife donated by Lee Patterson, Mort Garson's Plantasia & Peter Coffin's music for plants. This is an open session: participants are encouraged to join in this open performance for the plants. Please bring any texts or sounds you would like to share that you think the plants would like, or anything about plant sentience and our relationship to plants. Alternatively, you are invited to take a seat with the moss garden and listen. Hot tea and beers will be provided. Yoga Therapist, Hannah Rzysko will be running a progressive walking into stillness meditation, bringing people into a state of presence, observation and absorption specially designed for this evening. DEEP LISTENING sessions are a chance to meet & for sharing, listening, and being together in the world. DEEP LISTENING sessions are relaxed and open sessions which encourage us to listen to our environment and to each other. 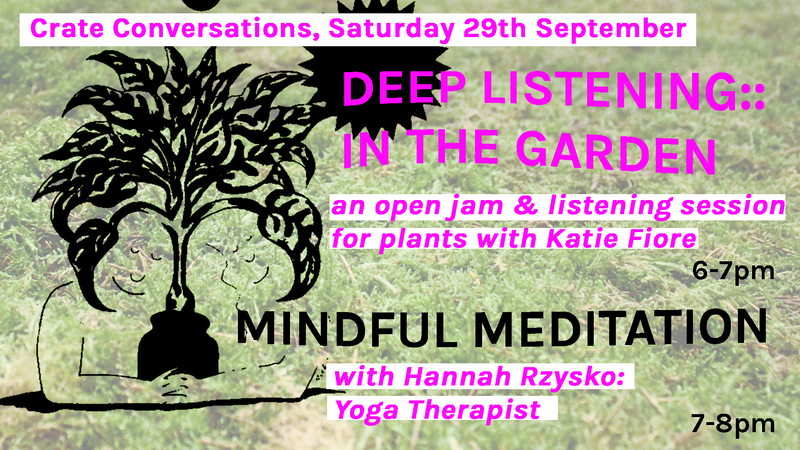 DEEP LISTENING are sessions are run by Open School East Associate Katie Fiore. They are part of the Tools For A Visionary Future series. Hannah Rzysko Yoga Teacher & Yoga Therapist has been teaching Hatha yoga since 2013, following 6 years of committed yoga practice. And in 2018, following 5 years of sharing yoga to those with varying complex needs, she completed 18 months of intensive study to become a certified Yoga Therapist - registered and accredited with the Complementary Natural Health Council.